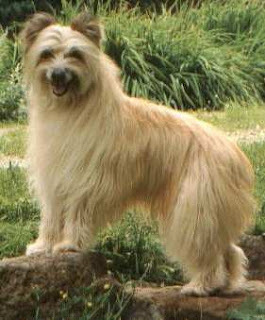 The Pyrenean shepherd was developed in France after world war I. This breed got national recognition in their country for their volunteer work, they are good watchdogs and can have a tendency to protect their family and territory. This dog breed is difficult to get out side of France. Pyrenean Shepherd breed of dogs are the smallest in French herding dogs, they are intelligent have courage and can give difficult time to strangers. They are brave and can run quite fast, this dog breed is not good for home, they don’t do good with children and other household pets. This dog breed are not recommended for first time dog owner because they are very demanding breed of dogs. This breed of dog come in two types ROUGH FACED and SMOOTH FACED, the rough faced breed has double coat, the outer coat and the inner one, the outer coat is long and flat where as the inner coat is minimal and fine/ the second one is smooth faced this breed has a single coat which is long soft and smooth this breed of dog is pleasant yet they need an early socialization and training. Training should be given to them with fairness and patience, they will not respond to harsh and hard methods of dog training. This breed of dogs is not recommend for small apartments, they are best for open/field environments and do good in villages. Pyrenean Shepherd needs weekly brushing to avoid dirt and dead hair, bathing should be done when mandatory . Keep a look out for symptoms of dog diseases in your dog and if you notice anything strange consult your dog's veterinarian at the earliest for diagnosis and early treatment.